TPT KeyWord Strength Index (2010-2011) - Downloadable Spreadsheet! What are the strongest keywords on TpT? Neither #1 nor #2 are surprises, but #3 (math) was certainly a surprise to me! 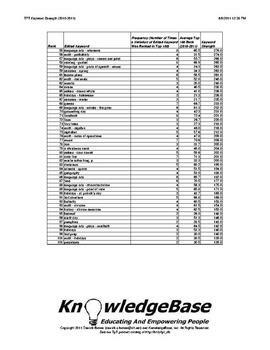 This report analyzes TpT's 2010-2011 keywords using a measure called "keyword strength". The measure is based on a keyword's average rank, as well as the number of times it appeared in the 2010-2011 "Top 100" TpT search engine rankings. This can be a valuable tool to help sellers understand TpT's marketplace supply and demand! 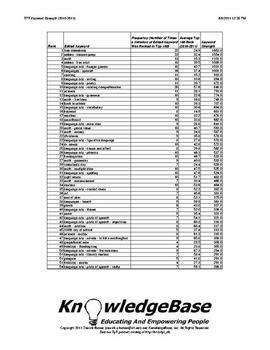 The PDF preview lists the top 20 keywords, while the Microsoft Excel Spreadsheet download provides the top 100 keywords. The spreadsheet allows alphabetical and numerical sorting, which can provide even more insight to TpT authors!